I generally do not spend too much time watching television, for despite nearly 400 channels from which to make a selection, I seldom find an engaging program. 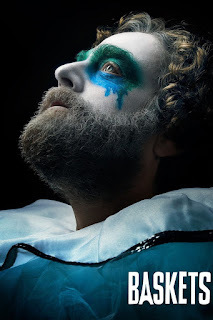 However, not too long ago, I started watching Baskets, a television show of the dark comedy genre starring Zack Galifianakis as a hopelessly misguided clown by the name Chip Baskets. He incidentally also plays his twin brother, Dale, and I'm not sure if that is supposed to be an allusion to the Disney cartoon chipmunks or perhaps more ironically the male dancers. In any event, the program is at once hilarious and tragic. Chip's lifelong ambition is to become a classically trained clown and he heads to France to attend a prestigious clown school (only in France would one find such a thing.) He falls hopelessly in love with a French girl who is only mildly amused by his adoration. He proposes to marry her, and she agrees but only to gain entry into the United States. When their "relationship" falls apart as most seem to do, she tells him, "Chip, bad beginnings make for bad endings." I thought to myself how truly that statement exemplifies some relationships and in my research discovered that this was actually a quote from Euripides, one of the great ancient Greek tragedians. Then it occurred me that this was the whole basis of the show. I cannot say with any degree of certainty whether the creators of the show had this in mind, but the coincidence would be too uncanny. 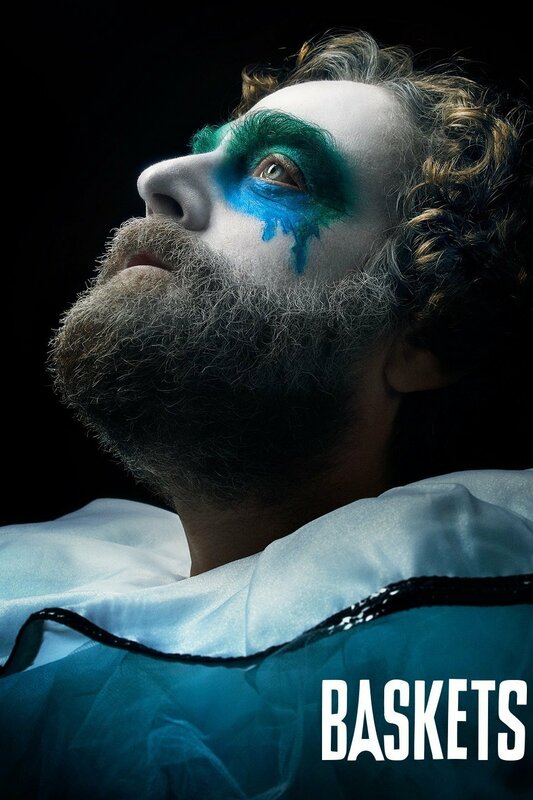 And so the ancient tradition of Greek tragedy and comedy lives on in the form of Baskets the clown. There is something about the combination of humor and tragedy that piques my interest...perhaps it is the irony. 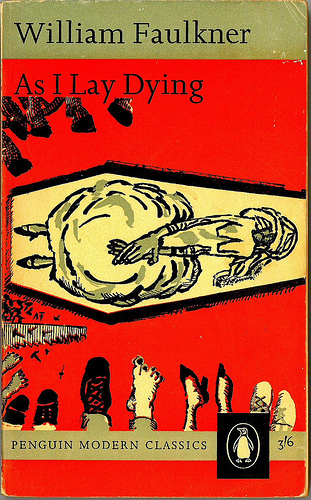 The seminal novel by William Faulkner which epitomizes this best is As I Lay Dying. I consider this to be his greatest work for several reasons. For instance, while others such as Joyce developed the stream of consciousness style of writing, it was Faulkner who produced this tour de force in writing by producing this novel written in 59 chapters, each one written from the perspective of one of the 15 characters in the book. But it is mostly for the sheer indulgence of the dark comedy genre that I truly enjoy this novel. I suppose the most graphic example of this is what happens to Addie Bundren's corpse when she dies. She is placed in the casket upside down, and when they drill air holes in the bottom of the casket, they end up drilling holes in her face. How funny is that? Another term for this type of novel is an "ironic quest" in contrast to a typical literary quest such as in Homer's Odyssey. Whereas the classic literary quest pits a heroic character against a series of obstacles needed to be overcome generally resulting in a "good ending", the ironic quest is a story of miscreant characters on an ill conceived journey which bears no fruit, and thus a "bad ending." William Faulkner was a great admirer of the Odyssey and the title of As I Lay Dying was actually taken from one of his favorite speeches in it. The character Odysseus, upon meeting Agamémnon in the Underworld, is told how he was murdered by his treacherous wife who would not even close his eyes as he was dying. The line referred to is: "As I lay dying, the woman with the dog's eyes would not close my eyes as I descended into Hades." Faulkner turned it around a bit in his novel in terms of gender reversal, but the eyes still play a central role. Like Chip Baskets, the saga of the Bundren family plays out as they embark on a journey from bad beginnings to bad endings. Euripides was born in Athens 480 BC (that's Before Christ- not Before Common Era as those authors of Newspeak would have us unremember). He was one of the three great tragedians, the others being Aeschylus and Sophocles. Unfortunately for Euripides and his colleagues, the Martini was not yet created, but if it was, I think they would have appreciated for what it is-a libation with both Apollonian and Dionysian elements, this having been previously described in Aristotle, Tragedy, and the Martini. To think that all this tragic theory has its roots more than 2000 years ago in a once great empire, now a diminutive country which today is dawdling along with social unrest due largely to economic disaster from failed social policies. What a difference a few millennia make. So as to make a good ending.